Each year my friends and I visit a special place for a few days to explore, have fun, laugh (a lot) and spent quality time together. This years location was Fez, Morocco. Because I visited Marrakech one month before I kinda knew what to expect of the Moroccan culture, habits and old Medina. Though I must say Fez really exceeded my expectations: so many stunning Madrasas (old Koran schools), handcraft shops and other interesting places to visit - like traditional tanneries, the Jewish quarter and enchanting royal palace. And of course lets not forget about the riads..
Our stay at riad Anata (located within walking distance of all main sights) was short, but such a blast. The Fez medina can be quite chaotic and overwhelming, so entering the calm atmosphere of the riad felt like such a warm welcome after a long day of travelling - just like the super relaxed rain shower (including eucalyptus black soap) and soft bed. All pure bliss. 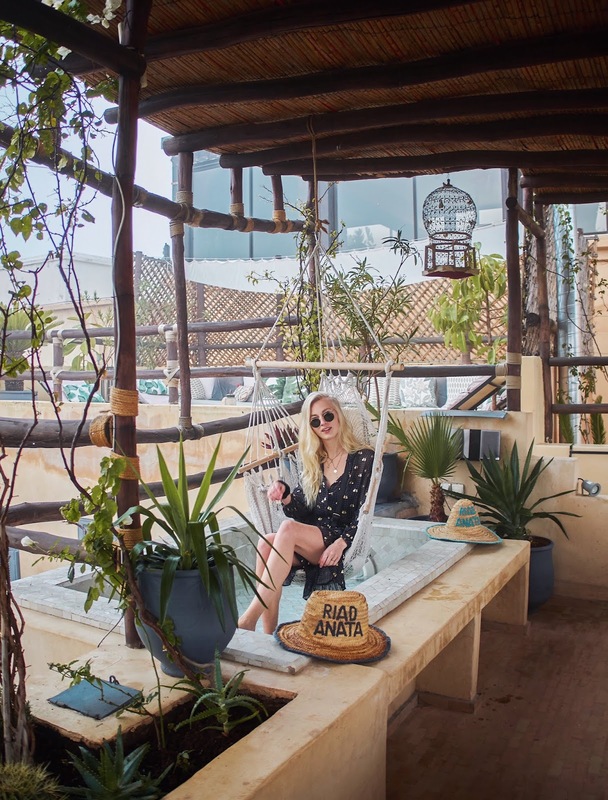 What we loved the most about riad Anata were its cute, photogenic courtyard and relaxing rooftop. Breakfast was homemade and served at the rooftop, and included Moroccan mint tea, fresh juice, yoghurt, eggs, pastries, crispy bread, fresh fruits etc. It was all so good, and served by the incredibly friendly cook. After breakfast we got to enjoy the sun a bit more before it was time for us to leave Fez again for our rainy homecountry. Last but not least: another interesting fact that is definitely worth mentioning is that riad Anata offers exclusive renting. This means that you can rent the entire riad - for example for private events, if you like to have more privacy or when travelling in a group. How cool is that? Anyway, my friends and I had a short but very sweet stay thanks to the high level of comfort, cuteness overload and gentle staff, and hope to visit again in the future!